Interested in getting involved in Hillel? Then let us know! We have interest forms for both prospective and current students - make sure to fill one out and we'll be in touch soon! 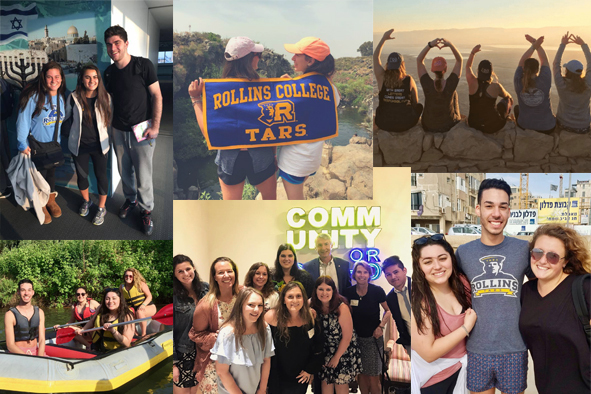 Rollins Hillel is an inclusive pluralistic community where students from all backgrounds can come together to celebrate, explore and deepen their connection to Judaism in an open and welcoming environment all while creating meaningful Jewish memories and friendships that will last a lifetime. We hope that you come and enjoy everything that Hillel has to offer- from delicious free Shabbat dinners, social events to even a 10-day free trip to Israel. If there is anything you want to see at Rollins Hillel, we want to make it happen, just email our Associate Director Emily Block at eblock@rollins.edu. And as we say at Rollins Hillel, "Welcome home."